Spring! It brings local Fairs and their wonderful treats! My all time favorite is the sweet cotton candy, pink and fluffy! But all too soon it’s here and gone and all you can do is dream. Now you can have it all year round with this lovely necklace of silky smooth Rose Quartz ovals. 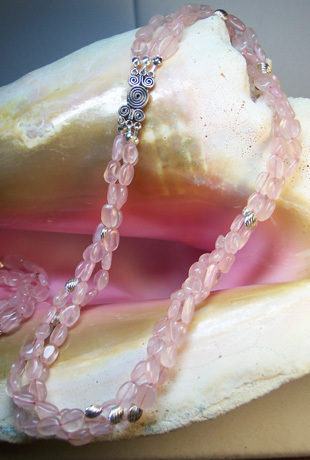 Three strands of 8x6-8x10mm Rose Quartz ovals, 4.5x6.5mm corrugated swirled oval Sterling Silver beads, strung on silk thread and finished off with a Sterling Silver three-strand clasp with a Swirl design.